The Skinny: Amusing follow-up to the previous year's Street Fighter. Thin on plot, but long on sick comic action, Return of the Street Fighter is a definite guilty pleasure. Review by Calvin McMillin: Sonny Chiba is back as Terry Tsurugi, and this time it's personal! Okay, it's always personal in these types of films, but believe me, when this guy's out for vengeance, he doesn't screw around. Like its predecessor, Return of the Street Fighter is ultra-violent: eyes are gouged, heads are smashed, and in the most disgustingly comical scene in the entire picture, Tsurugi hits a guy so hard that the dude's eyes pop out! It may be sick fun, but it's good fun all the same. As the second chapter in the always-entertaining Street Fighter series, Return of the Street Fighter ranks as one of the rare sequels that actually rivals the first. However, in the beginning the movie doesn't seem quite as promising. For starters, the plot is basically the same as the original, as Tsurugi is again working for the mob, but later he refuses to accept a hit contract because it violates his personal code of honor. 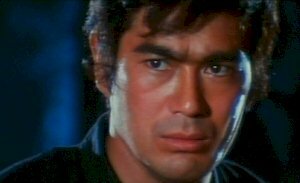 Tsurugi balks at killing his friend Masaoko (Masafumi Suzuki, reprising his role from the original), much to the dismay of the mafia, led by the ridiculously named Don Costello (Claude Gannyon). As is usual in martial arts flicks, violence ensues. Add to this familiarity a heavy reliance on flashbacks and one too many "let's pad this movie with dojo training" sequences, and you've got a sequel that's seemingly doomed from the get-go. But surprisingly, the movie succeeds in carving out its own niche. What sets this film apart from the original are the little variations given to the formula. For a straight genre piece, Return of the Street Fighter actually sports a few surprises. The true identity of Don Costello, the rich, white man behind everything is pretty amusing, as is new character Kitty (Yoko Ichiji), Tsurugi's jive-talking female sidekick who may be more than she seems. There's even the shocking return of a presumed dead character from the first film, whose reappearance will elicit cheers at the onset and laughter as the scene progresses. Perhaps the best improvement is Tsurugi himself. In this movie, he's thoroughly likable, but is by no means a nice guy. Perhaps in response to the tragic events of the previous film, Terry Tsurugi has mellowed a little; he's not a total prick (no selling women into prostitution anymore), but he's still a definite force to be reckoned withthe celluloid embodiment of the term "anti-hero." It's also worth noting that Tsurugi's heavy breathing habit from the first film has been cut down considerably. I guess all that chi was finally redistributed.